We got together with 8 parents and conducted hands-on testing of 14 different booster seats to find you the best options for 2019. We tested both booster seats and combination booster seats in terms of ease of use, price, safety, reliability, and accommodating a wide range of weights and heights. Our results revealed four primary brands to focus on: Britax, Graco, Chicco, and Clek. The top 5 booster seats are listed below, followed by reviews of 10 different models that vary widely in features and price. In our quest to find the best booster seats of the year, our hands-on reviews focused on safety, versatility, convenience, ease of use, comfort, and price. For more in-depth information about how we considered each of these factors, scroll down toward the end of this page. Otherwise, let's get into the results! Here are the Best Booster Seats of 2019! 1. Britax Frontier ClickTight Booster Car Seat. Specifications: Supports from 25-120 pounds and 30-62" tall. With the 5-point harness it supports from 25-90 pounds (30-58"), and with vehicle seat belt (as a belt-positioning booster) from 90-120 pounds (45-62"). The seat itself weighs about 25 pounds and is 19" wide at the base. What we liked: Britax has a superior reputation for car seat safety, and their booster car seats are no exception. It has two layers of side impact protection, uses the ClickTight install system, has a SafeCell impact absorbing base, and uses a steel-reinforced frame. This booster transitions from a car seat with a 5-point harness to a belt-positioning booster car seat, which makes this technically a combination booster car seat. Includes premium LATCH system for use up to 40 pounds, quick-adjust headrest and harness height, integrated cup holders, machine-washable cover, and adjustable incline. Every feature was easy to use and adjust, and the cushioning and fabric were soft and durable. What we disliked: Likely due to its stellar safety features, this booster seat comes in at a hefty 25 pounds, making it less ideal for easily swapping between vehicles. It is also pretty wide (19"), so it's not ideal for trying to squeeze three car seats in a row. 2. 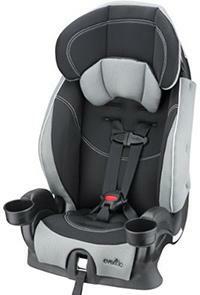 Britax Highpoint Belt-positioning Booster Car Seat. Specifications: Supports from 40-120 pounds and 38-63" tall, using the vehicle's seat belt (as a belt-positioning booster). The seat itself weighs about 13 pounds and is 21.5" wide at the base. 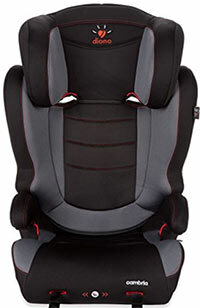 What we liked: The Britax reputation for safety makes their booster seats stand out against the crowd. This Highpoint booster seat has 3 layers of side impact protection, and uses a series of bright red guides to help you figure out how to position and adjust the seat and seat belt for optimal safety. Includes lower LATCH anchors to keep the booster seat attached to your car when not in use, and uses awesome Cool Flow fabric that is highly breathable and does a great job preventing sweaty backs. It also has an easily adjustable head rest that goes very high without making a gap in the back, two large cup holders, and great weight range. What we disliked: There is no steel-reinforced frame or energy-absorbing foam, which makes it much lighter but also potentially not as safe as the Frontier. Also, the lower belt-positioner was a bit of a pain to use, and the seat is very wide and not ideal for fitting three car seats in a row. 3. 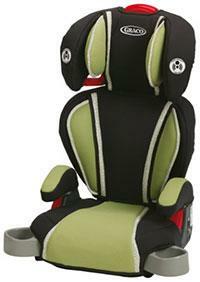 Graco AFFIX Booster Car Seat with LATCH. Specifications: Supports from 30-100 pounds and 38-57" tall, using the vehicle's seat belt (as a belt-positioning booster). Can also be used as a backless booster. The seat itself weighs only about 9.5 pounds and is only 18" wide at the base. What we liked: The price is right, coming in at only about $60 for a well-featured and safe booster seat. It includes the lower LATCH system to secure the booster to the seat while not in use, side impact protection, high quality and soft fabrics that we found easy to clean, and two cup holders (one for holding cups and one for other stuff). It's lightweight and narrow, making it an ideal booster seat for tighter installations and for easily swapping between vehicles. This seat has some nice versatility, allowing for use as a belt-positioning booster seat or a backless booster seat for taller kiddos. What we disliked: There is no steel-reinforced frame or energy-absorbing foam. It feels a bit hollow and cheap, and the fabric and cushioning isn't as soft as the Britax options. Specifications: Supports from 33-100 pounds and 38-57" tall, using the vehicle's seat belt (as a belt-positioning booster). The seat itself weighs 20 pounds and is only 18" wide at the base (and arm rests). What we liked: This booster seat is made in North America and can be used as a high-back booster seat or a bottom-only backless booster seat. This is an awesome booster car seat with some great style and features, with a narrow enough base to squeeze into some pretty tight seating arrangements. It includes the LATCH system to secure it to the seat when unoccupied, and has some serious safety chops: a steel-reinforced frame, energy-absorbing foam, and deep side impact protection. The seat is comfortable and uses GreenGuard certified fabric, and has a reclining back (if using the LATCH) to fit most back seat angles quite nicely. Safety, style, and versatility! What we disliked: The belt-positioners are nice to have, but we found them pretty annoying especially if you have a smaller car. When you adjust the headrest up high it leaves a gap in the back with just the metal bars, which can be uncomfortable for taller kids. Finally, this booster seat is more expensive than most other options (other than the Frontier), coming in at about $200. Specifications: Supports from 25-100 pounds and up to 57" tall. With the 5-point harness it supports from 25-65 pounds (up to 54"), and with vehicle seat belt (as a belt-positioning booster) from 40-100 pounds (38-57"). The seat itself weighs about 25 pounds and is 17.5" wide at the base. What we liked: This is one of only a few combination booster car seats on our list, which means it can convert from a car seat with a 5-point harness to a belt-positioning high-back booster seat, giving it some great versatility. The build quality is superb here, and we loved the soft-touch fabrics and plastics, ample cushioning, and easy to use adjustments and buckles. For safety, it includes bubble-leveling, side-impact protection, a steel-reinforced frame, and EPS energy-absorbing foam. For convenience, it has a no-rethread harness, wide headrest height and recline adjustability, removable and dishwasher safe cup holders, and comfortable arm rests. The cover was easy to remove and wash, and the seat felt very safe and secure. No wonder that it's a top-rated pick by Consumer Reports! What we disliked: Coming in at about $200, it's the same price as the Clek Oobr, which is a little steep. But for a combination booster that might be a reasonable price. The adjustment buttons for the harness and headrest are a little flimsy, and the seat itself is really heavy (but surprisingly narrow). Specifications: Supports from 30-100 pounds and 38-57" tall, using the vehicle's seat belt (as a belt-positioning booster). Can also be used as a backless booster from 40-110 pounds. The seat itself weighs 10 pounds and is 17" wide at the base (with the cup holder collapsed). What we liked: We like Chicco baby products because they combine great features and safety while maintaining a reasonable cost. This booster seat is similar in features to the Graco Affix option, above. For safety, it has Chicco's DuoZone side-impact protection, shoulder and lap belt positioners and guides, and a LATCH system to keep the seat securely in your vehicle when unoccupied. We liked that it has two cup holders, two recline positions, a wide range of headrest height adjustments, and an easily removable cover for machine washing. We also liked the collapsible cup holders to make more room in tighter back seats. What we disliked: The shoulder belt positioners were not ideal and we found that the seat belt would randomly slip out of the positioner. We found the colors a little bland (and some said ugly), and we weren't impressed with the safety features (no steel-reinforced frame or energy-absorbing foam). Specifications: Supports from 40-120 pounds and 38-63" tall, using the vehicle's seat belt (as a belt-positioning booster). Can also be used as a backless booster. The seat itself weighs 10 pounds and is 18.5" wide at the base. What we liked: Diono has a long history of making excellent convertible car seats and booster seats, with superior quality, comfort, and safety. This booster seat can serve as a belt-positioning booster or a backless booster, giving it some nice versatility. For safety, it has head and torso side-impact protection, LATCH connectors to secure it to the vehicle, energy-absorbing EPE foam, and aluminum lined sidewalls. For features, it has a good weight range and a superior upper height range (63") for tall kids. 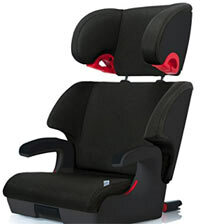 There is adjustable recline, and a belt-positioning strap that is unique to this Diono booster seat. The fit and finish are high quality and the fabrics are soft and washable. What we disliked: We were surprised that there is no steel-reinforced frame like with most Diono car seats. The weight range is good, but could go lower. There is also no cup holder, and relatively thin padding on the seat and back. Installation can be a little tricky so be sure to read the manual. At about $100, it's a little pricey given its features. 8. 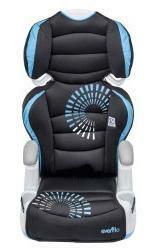 Graco Highback TurboBooster Car Seat. Specifications: Supports from 30-100 pounds and 38-57" tall, using the vehicle's seat belt (as a belt-positioning booster). Can also be used as a backless booster. The seat itself weighs about 8 pounds and is only about 16.5" wide at the base. What we liked: This is definitely one of the best booster car seat options for fitting three car seats in a row, given its relatively narrow stance of about 16.5" wide; it's also very lightweight so it's perfect for swapping between vehicles. It is a great cheap booster car seat option, coming in at only about $45, but having some decent features. Features include side-impact protection, adjustable headrest height, two flip-out/in cup holders, belt positioners, and reasonably soft and cushioned fabric. It has some pretty good bang for the buck given that it converts to a backless booster, though we prefer the Graco Affix for only about $15 more. What we disliked: This is a relatively bare-bones booster car seat, without the LATCH system, no steel-reinforced frame, no energy-absorbing foam, and not so comfortable seat padding. 9. Evenflo Chase LX Booster Car Seat. Specifications: Supports from 22-110 pounds and 28-57" tall, using either the 5-point harness (22-40 pounds and 28-50"), or the belt-positioning booster (40-110 pounds and 43.3-57"). The seat itself weighs 11 pounds and is 20" wide at the base. What we liked: This is a combination booster seat, which means that it can be used with a 5-point harness and then transitioned to a belt-positioning booster seat that uses the vehicle's seat belt. For only around $65 that's some serious versatility when you consider that you can use it as small as 22 pounds (and 28" tall), and all the way up to 110 pounds (and 50" tall). The ability to go down to 22 pounds is huge, though we strongly suggest using a rear-facing car seat for as long as possible before converting to any front-facing car seat. The overall comfort and styling were also pretty good for the price, and we liked that it has two cup holders, the LATCH system, and side-impact protection. What we disliked: The harness needs to be re-threaded from the back to adjust its height, the belt-positioners are in an awkward position making them difficult to use, the seating surface is very narrow and shallow (even for our 6 year old), and the lower padding leaves something to be desired (it's very thin). In terms of safety, it does not have a steel-reinforced frame or energy-absorbing foam. The cup holders are shallow and flimsy. 10. Evenflo AMP Big Kid Booster Car Seat. Specifications: Supports from 30-110 pounds and 38-57" tall, and can be used as a belt-positioning booster or a backless booster (40-110 pounds and 40-57" tall). The seat itself weighs only 8 pounds and is 19" wide at the base. What we liked: This is a no-frills and relatively inexpensive (about $33) booster car seat that is made in the USA and can be converted to a backless booster. It has an adjustable back height, smooth belt-positioners, and two cup holders. It also has head and torso side-impact protection, while being lightweight and easily swapped between vehicles. Did we mention how darn cheap this booster seat is!? What we disliked: Look, they're not trying to trick anyone with this booster seat. It's cheap and no-frills, there just aren't a lot of safety or convenience features. If you don't expect much, you will be satisfied with its basic functionality. How we found the best booster car seats! Booster versus Combination Car Seat? Parents often wonder whether to get a combination booster (harness booster) or a regular booster car seat for their child. There are a few things to consider when assessing the type of booster you need. First, the differences between the two car seats. A regular booster seat will use the vehicle's seat belts to secure the child into the seat. The LATCH system might also be used to secure the booster into the car, but this is only to keep the booster in place when it's not being used (so it doesn't fly around the car when you need to stop quickly). A regular booster car seat will not have a built-in harness system. Because it doesn't have the 5-point harness system, it is only to be used with children over 40 pounds and at least 38" tall. The combination booster car seat is a bit different, as it includes the 5-point harness for smaller children and then transitions to a belt-positioning booster (using the vehicle's safety belts). The combination booster car seat is sometimes called a combination harness2booster car seat or a harness booster, and is useful for parents who want to go directly from an infant car seat into a front-facing car seat that will transition to a booster. But it might not be a super comfortable ride, at least not as much as a (usually more expensive) convertible car seat. So if you and your baby are ready to transition to front-facing but your baby is not yet over 40 pounds and at least 38" tall, then you should probably consider a combination booster, allowing you to use the 5-point harness to support kids as small as about 30" tall and 25 pounds. And a combination booster usually comes in at around $150-200, which is less expensive than most top-rated convertible car seats. And a 3in1 harness booster can go all the way from a booster with a 5-point harness, to a belt-positioning booster, to a backless booster (bottom-only), giving you serious versatility. Why Use a Booster Car Seat? Though many parents do skip from a convertible car seat directly to seat belts, this is not recommended by the NHTSA because the booster seat positions the child correctly for using the lap and shoulder belts. Without the booster car seat, the child's lap and shoulders will be too low and the seat belt will not fit properly, posing a substantial safety risk. For example, if the lap belt is too high it can cause abdominal injury during a crash, and if the shoulder belt is too high it will be on the neck instead of the shoulder. The booster car seats do a great job of reducing injury risk due to improper seat belt positioning. Depending on the height of your child and where the vehicle's shoulder belt hits your child's shoulder, you will need to use the belt-positioning booster (with the highback on it), or for taller kids (over about 45" tall) you can use the backless boosters because the vehicle's seat belt will hit the child's shoulder in the appropriate way. Ease of Use: Now that your child will be expected to buckle and unbuckle him/herself, ease of use becomes very important. The easier the latching mechanisms and reach-over to the buckle, the less frustrating of a transition this will be to a booster car seat. For our focus groups, we got 10 different booster car seats. For the ease of use portion of our ratings, we focused on how easily kids could manage any buckles and latches, and how well the booster positioned the car's shoulder belt in a way that made it easy for kids to reach. All of our below options scored very well in this category. Some of them provide their own buckle positioning mechanisms, ensuring ease of use and safety. Some also provide a LATCH system to secure the seat to the car; this is not for child safety, this is to keep the booster secure in the car when it's not in use. For instance, if you have an accident or need to stop short without your child in the car, you don't want the booster flying toward you. Many parents thought that relying on the car's shoulder and lap belt is great because you can be more confident regarding safety standards of the vehicle manufacturer, and it teaches your child how to use and correctly position a regular seat belt (a skill they will use throughout life!). Price: Now that your child is graduating from a conventional car seat (see our list of the best convertible car seats), you will be happy to find out that booster car seats are substantially less expensive. We suggest spending about $50-100 on a high quality booster seat, though you will notice that our most expensive option is about $130. We don't think it's necessary to spend that much to get a great booster car seat, but if you really like the features there are some very comfortable and high quality options. Of course, the most expensive booster car seats also tend to be plusher, with softer fabrics, and use higher quality and lighter parts. It is important to mention, though, that more expensive booster car seats are not necessarily safer. When used correctly, all booster seats meet safety requirements of the NHTSA (National Highway Traffic Safety Administration). Some of the less expensive brands may meet NHTSA minimum requirements whereas others go beyond those standards, meeting or exceeding highway safety regulations. A good example of going beyond NHTSA requirements to increase safety is using multiple (or very thick) layers of side impact protection, have a steel-reinforced frame, and use more extensive energy-absorbing foam. Child Weight and Height: The U.S. federal government recommends booster car seats from as early as 4 years old (and a minimum of 40 lbs) to as late as 12 years old. Typically parents switch to just the vehicle's seat and seat belt at around 8-9 years old. Most booster car seats are for children from about 40 to 100 lbs, though some go up over 100 lbs. In terms of height, they are usually made for kids 38" to 60" tall (that's 3'2" to 5' tall). But always check the details on the box or label because even within a single brand, different models have different specifications. We do our best to list those below along with each review. Here are some more details about each of the best booster car seats. The Britax Frontier ClickTight Booster Car Seat: Britax car seats are truly some of the safest and most reliable car seats on the market, and booster seats are no exception. 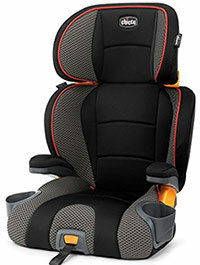 Britax makes several booster seats: the Pinnacle, Frontier, Pioneer, Highpoint, and Skyline. That list goes from most to least expensive, ranging from nearly $400 for the Pinnacle to about $100 for the Skyline. The Pinnacle, Frontier, and Pioneer are combination booster seats that transition from a booster with 5-point harness to to belt-positioning booster. The Highpoint and Skyline are belt-positioning boosters only. Instead of reviewing them all, we selected and tested out two of them, one toward the more expensive side (this one, which is about $280), and the second-to-least expensive one (the Highline, below). They are both truly excellent. They are super safe, use true side impact protection, use SafeCell impact absorbing material, and are equipped with easy to use LATCH connections. They are also extremely well built, one might even say over-engineered, making them last for several years even under harsh use conditions. And all of that does come at an increased price tag. This particular Britax booster, the Frontier ClickTight, is no exception. This versatile booster can support kids from 2 years old (25 pounds) up to 120 pounds. From 25-90 pounds, you can use the 5-point harness system, attaching the booster to your vehicle using the lap/shoulder belt or included LATCH system (until about 40 pounds). This technically makes this a combination booster car seat, which means that it begins as a car seat with a 5-point harness. 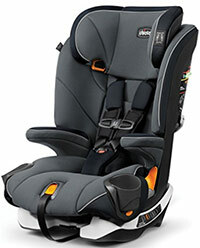 You can use the harness up to 90 pounds, but if you'd like to switch to the vehicle's seat belt, once your child is over 40 pounds you can store the 5-point harness behind the seat and use only the vehicle's lap/shoulder belt (with the shoulder belt guide for belt-positioning), and attach the seat itself to the vehicle using the LATCH. That last part is not necessary, just a nice feature. So this is a very versatile booster, and it is ideal for parents who are ready to graduate from an infant car seat and skip the convertible car seat stage entirely. Safety features abound: it has two layers of side impact protection (head rest and shell), the ClickTight installation system that lets you use the vehicle's lap/shoulder belt in a very intuitive way to thread the seatbelt and firmly secure the seat (and be certain of it by checking the indicator), it has a SafeCell impact absorbing base, and it has a steel frame inside the booster itself. Of course, the steel frame increases the weight of the seat a bit (to 25 pounds), though we think it's definitely worth it. Features also abound: it has a quick-adjust headrest and harness height adjustment (9 levels), two cupholders integrated into the seat (not dangling from the sides), a machine-washable cover, front-access incline adjustments (this was a great feature! ), and an intuitive level indicator. We found the chest strap and crotch buckles really easy to use, and had an audible click to give us the confidence they were secure. We also liked the quality of the fabric, which was soft and supple while still being easy to wipe clean. Overall, we fell in love with this convertible booster seat immediately, and it is withstanding the test of time. This is definitely the best booster seat of the year, and we highly recommend it! Keep in mind that it is pretty large, coming in at about 19" wide at the base, so this is not a good option if you plan on fitting three car seats in a row. If you're looking for a similar booster without the 5-point harness capability, then check out the Highpoint (below). Interested? 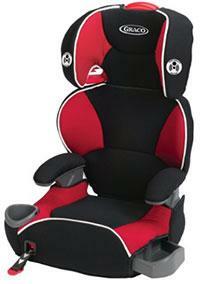 You can check out the Britax Frontier Booster Seat here. The Britax Highpoint Booster Car Seat: This is a relatively new (2018) addition to the Britax line-up of booster car seats. 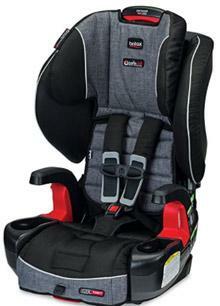 It is very similar to the Britax Skyline in that they are both belt-positioning booster seats, but it differs primarily in its addition of an extra layer of side impact protection (a third layer) and its fabric options. But let's start with the basic features of this booster seat. It is designed to support children from 40 pounds (or 38" tall) up to 120 pounds (or 63" tall). It does this with a 10-point adjustable headrest that extends way up without making a gap in the back (like the Clek does). For added versatility, it has two removable cup-holders, and an awesome LATCH adjustment system that makes installation a breeze. We also loved the fabrics. We tested one with a jersey-knit cotton that was soft and reasonably breathable. But then we tested one with their Cool Flow fabric that includes mesh fabric in the lower and upper back areas (you know, the areas that get super sweaty!). While that fabric is about $10 more, we think it's worth the investment. As you know, Britax is world-renowned for making the safest booster, convertible, and infant car seats, and this booster seat is no exception. It has an easy to use and effective shoulder belt-positioner that the seat belt never slipped out of accidentally, a crotch belt-positioner that made sure the lap belt was appropriately positioned, and bright red guides to show you exactly where the vehicle's seat belts should be going. And it has lower LATCH anchors to keep it from flying around the car when not in use, which is always an appreciated feature. Now for that side-impact protection: it's huge and wide (about 19.5" wide), and uses 3 layers of side-impact padding, one up by the head, one at the shoulders, and another behind the shoulders. So you're getting a lot of safety features here for this relatively low price, which we can definitely get behind! This is a great booster seat and there are no major drawbacks to report. Some minor grips are: first, the lower belt-positioner is a bit of a pain to use, but we understand that it's there to increase safe positioning of the lap belt. Second, it's very wide, so it's not a good option for people interested in fitting three car seats in the back row. Third, it does not have a steel-reinforced frame like the Frontier, but that does make it less expensive and quite a bit lighter to lug around between vehicles. Other than that, this is an excellent booster seat and we enjoyed testing it. It's a good replacement for the old Britax Parkway SGL, which was very similar but without the large side impact wings. Interested? 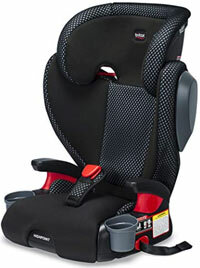 You can check out the Britax Highpoint Booster Seat here. The Graco Affix Booster Car Seat: This is a no-frills and reasonably priced booster seat option by Graco that includes the convenience of a LATCH system for keeping the seat in place when it's not being used. The Graco has many things that the Britax Highpoint offers: high quality and soft fabrics that are easy to clean, one cup holder and one "stuff" holder, and color/design options that are subtle and not overwhelming. We liked that for this price point we could get a booster seat with LATCH system to secure the booster into you car when the seat is unoccupied. Second, it has a convenient LATCH tightener on the front that you can pull on to make the booster fit snugly in your car. Third, it is only about $60. Finally, it is only just over 9 pounds, making it quite a bit than the Britax options. So why is it lower on our list? Just some small things. First, it has no lap belt positioning system to reduce the chance of abdominal injury during an accident. Second, it supports kids from 30 to 100 pounds, which is 20 pounds less than the Britax can manage. Finally, the feel of the fabric isn't quite as soft (and high quality feeling) as the Britax. And overall, this Graco Affix youth booster seat doesn't feel as substantial and well-built as the Britax options; that's a subjective opinion based on our experience, but it's worth mentioning. The Britax options feel really solid and well constructed, while this one feels a little more hollow and inexpensive. Really, you can't go wrong with the Britax or the Graco; it really just depends on if you want to spend the extra $40 to get something a bit more versatile, higher quality, and possibly safer (especially the Frontier). Note that this booster seat is 18" wide, so it's nice and narrow, basically the same width as the Oobr. The Clek Oobr Booster Car Seat: Clek has really taken the car seat market by storm, with the fantastic Clek convertible car seats (the Fllo and Foonf), and now this Clek Oobr booster seat really impressed us. As with all Clek car seats, it has the simple european styling we've come to expect, with clean lines, simple color schemes, and a relatively small form factor. Speaking of its size, it's narrow enough to fit other passengers in the back seat, coming in at only about 18" wide if you remove the cup holder (it's 15.5" wide at the bottom edge, 18" wide at the arm rests, and about 16" wide at the headrest). That makes for a reasonably narrow booster seat, which will come in handly if you want to fit three kids in the back seat of a smaller vehicle. Like the Britax and Graco boosters, this seat includes the LATCH system for keeping the seat in place while it's not in use. Like the Britax Parkway and Graco Affix, it does not include a harness system, so it serves only two roles: a high-back booster seat, and a bottom-only booster seat. The high back booster is rated for 33-100 pounds (or 38-57" tall), and the bottom-only (backless mode) is rated for 40-100 pounds (or 40-57" tall). So that's a pretty good overall weight range, going lower than the other models (down to 33 pounds), but not quite as high as the Britax boosters. I can't imagine a situation where a child who is under 40 pounds would be using a booster without a harness, but we don't write the rules! Like the Britax, this booster seat was built for child safety, with its fully metal structure, energy-absorbing foam, and structural headrest with deep side impact protection. You can feel confident that your child is safe in the Clek Oobr, but it also has pretty reasonable comfort. It's not a super plush and cozy booster seat by any means, but it's definitely more comfortable than the Evenflo or Chicco options. As a bonus, it has adjustable recline which is nice for longer trips and for vehicle seats that are at a lower angle - but note that you can only use the recline function if the seat is LATCH'd in. In our testing, we found several things we liked about this seat. First, the recline function was easy to use and really did make things more comfortable for longer journeys. Second, the seat fabric was soft and easy to clean, and we loved that it was Greenguard certified to not contain harmful chemicals. Third, the booster seat was really sturdy and robust, including the lower and upper parts, and the super sturdy and well-integrated adjustable headrest. Fourth, out of the box it was easy to assemble, and we felt confident with the safety features, including a metal-reinforced substructure, energy-absorbing foam, a structural head-rest, and side-impact protection. Fifth, it uses belt positioners to make sure your vehicle's seat belt is positioned correctly. Negatives? Well, the belt positioners can be annoying especially if you have a smaller car, since they can interfere a bit with buckling. Also, when the child is tall, the headrest needs to be moved way up, exposing a big gap between the back and the headrest. And that gap is just the metal bars, which seems uncomfortable. None of our testing kids realized or complained, but it's worth pointing out. Finally, the biggest drawback for this booster seat is the price: about $200, which is much more than all of the other options on this list, with one exception: the nearly $300 Britax Frontier. But the Frontier has a harness to use front-facing until you're read to use the vehicle's seat belts, justifying the higher cost. What does the Clek have to justify its $200 price tag? Safety, style, and versatility - but we'll let you figure out whether it's worth the price! The Chicco MyFit Convertible Booster Car Seat: This Chicco booster car seat was a new release for 2018, and there's a lot to be excited about. Like the Britax Frontier, it is technically a combination booster car seat, which means that it transitions from a forward-facing car seat with a 5-point harness (25-65 pounds), to a belt-positioning booster car seat (40-100 pounds). We generally love Chicco car seats, and some of them are at the top of our best-of lists (like the KeyFit 30 and Fit2 at the top of our list of best infant car seats), and this combination car seat is no exception. The fit and finish were very high quality, with good padding, soft-touch fabrics and plastics, and easy to use connectors and adjustments. The 5-point harness comes with a nice set of shoulder pads, it has 2 removable cup holders that are dishwasher safe (! ), a 9-position headrest adjustment, 4-position recline, and no-rethread harness. Installation was easy with the bubble level on the side, vehicle seat belt lock-offs (for when you're not using LATCH), premium LATCH connectors, and easy adjustments. And there are some great safety features, including side impact protection, a steel-reinforced frame, and EPS energy-absorbing foam. Our testing kids found it comfortable for long car trips, and we thought that the cover was easy enough to remove and wash. Downfalls? Well, it's a bit pricey, though right in the range of the other combination booster seats (about $199). It also has some parts that seem a little flimsy, like the harness adjustment button on the front, and the headrest adjustment lever on the upper rear. Finally, it's really large, but it's actually reasonably narrow (17.5") in comparison to other options on this list, making it a slightly better option for fitting more than 2 car seats in a row. Other than that, we really liked this booster car seat and thought it was well-deserving of this spot on our list! It's a great alternative to the more expensive Britax Frontier for parents looking to save a little money, and it's top-rated by Consumer Reports so it's hard to go wrong! The Chicco KidFit Booster Car Seat: This is a relatively new Chicco booster car seat option, and we only recently were able to get our hands on it for testing. It's very similar to the Graco Affix Booster with LATCH system, above, though it does have a higher price tag and some additional features. The core features are highly similar: it supports kids from 30 to 110 pounds, though we find it hard-pressed to imagine ever using a booster car seat for a kid under 45-50 pounds. It has multiple easy to adjust headrest heights, specifically 10, which is necessary for fitting taller and older children. And it's not just the headrest part that adjusts, it's the entire back, which is important for getting that perfect belt height on the shoulder. We did find the seating surface a bit comfier than the Graco Affix above, like it has some extra padding, but it's not anything substantial. The one feature that we were really excited about was the LATCH system and its front tightening system that is just like the one on the Affix, this is a really great feature that helps especially when you frequently swap the booster seat between vehicles. It does also have a built in recline, which is nice for fitting more upright back seats (like in trucks or Jeeps), or relatively reclined ones like in sedans and SUVs. While the Affix has a cup holder on one side and the slide-in snack drawer on the other, this seat has two cup holders, both of which are collapsible to make room for tighter situations (like when trying to squeeze 3 car seats or boosters in a row). In fact, it's the narrowest booster seat on our list, coming in at just a hair under 17" wide at the base (the shoulders are nearly 19" wide), making it a great option for cramped back seats (especially in backless mode). We found the fabric reasonably soft but durable, and easy to clean. For tougher cleaning situations, you can easily remove the cover and throw it in the washing machine. Negatives? Well, we thought the belt-positioner didn't always do a great job holding the seat belt in place, if the booster gets jostled around at all the seat belt sometimes pops out. Though it was rare, we didn't have that issue with the Affix, Also, it's unclear why this particular booster is about $20 more than the Affix, even though feature-for-feature we found it very similar. Overall, a great seat and if the colors and patterns strike your fancy relative to the Affix, it might be worth the extra cash! The Diono Cambria Booster Car Seat: This is an awesome new Diono booster car seat that we got our hands on for testing in mid-2018. So it's relatively new to our list, but we are really impressed with it and expect it might climb up the list if it continues to perform in our longer term testing. Coming in at a reasonable price for a Diono car seat, around $80 (their Radian car seats are much more than that), this is right in the middle of the pack in terms of price. But it's toward the head of the pack in terms of features and capabilities. This booster seat supports kids from 40 pounds up to an awesome 120 pounds; in terms of height, it supports from 38" tall up to 63" tall. To accommodate that range, it has two recline positions and 6 headrest positions. The straps on the front are to adjust recline, and there's a red handle hiding behind the headrest that is used to adjust its height. If you are ready to transition to backless booster mode, the back is easily detached. The head and torso have side-impact protection, and it comes equipped with the old-style LATCH system to hold it into the vehicle. Of course, this is just for safety when the seat is unoccupied, so it doesn't fly around the vehicle in the event of an accident. Speaking of baby safety, we were surprised to realize that this booster has no steel-reinforced frame - Diono is well-known for having full steel frames in many of their seats, but this was one was skipped. We found the seat to be very large, strudy, and generally comfortable. It's not as comfortable as the high-end Britax USA models but definitely more than the Evenflo options. But there were also a lot of drawbacks. Installation was a bit complicated and we needed to read the full owner's manual - of course we realize that everyone should read the entire manual every time, but many other booster seats are very simple to install (especially when you've been doing it for 10 years!). But this one has some features like a belt-positioning strap that you need to read how to use. Additional things that we were unimpressed with: the lack of cup holders, the very thin cover padding that made it less than comfortable, and we don't feel like it lives up to the Diono reputation for safety features. We also want to point out that this is a pretty wide booster seat and you might have difficulty with some narrow vehicles. In a BMW 3-series, Honda Civic, and Toyota Corolla, we found that it's wide 19" stance made it sit right on top of the seat belt buckles, making buckling much more challenging than it should be. So it has good styling, great versatility, and the Diono reputation behind it. But it also has a lot of limitations that we think are important to consider when comparing this to something like the Parkway SGL or even the Graco Affix. The Graco Highback TurboBooster Car Seat: This Graco booster seat is very similar to the Graco Affix: high quality, soft easy-clean fabrics, two shallow holders (we were able to fit a narrow cup, or a snack), and several color/design options to choose from. The critical difference between the Affix versus Highback TurboBooster is that the Affix has the LATCH system but the Graco TurboBooster does not. But because it doesn't have the LATCH system, it is a bit cheaper than the Graco Affix, coming in at only about $50. It supports kids from 30 to 100 pounds (40 to 100 when the back is removed). Finally, it is only just over 8 pounds, making it lighter than every other option on our list except for the Evenflo AMP (below). You can't go wrong with these two Graco options, and it really just depends on whether you want the LATCH system. In our household, with two kids and two cars, we find it much easier to use the seat without a LATCH system to quickly swap the booster between the two vehicles. And no, the LATCH system is supposedly not any safer for the child, but it does secure the seat in the car when it isn't being used so it won't fly around in the event of heavy braking or an accident. So if you want the LATCH, go with the Graco Affix, but if you don't need it, go with this Graco Highback Turbobooster car seat. If your child is over about 45" tall, you might be interested in a backless booster, and the Graco Backless Turbobooster is definitely one of the best backless booster car seat options (only about $30). The Evenflo Chase LX Booster Car Seat: Here is an inexpensive (about $65) and highly versatile booster car seat that can be used in two ways. First, as a harnessed booster (this is called a combination booster car seat) from 22-40 pounds, and then second as a belt-positioning booster from 40-110 pounds. The belt-positioning booster is the same as the others on this list: it uses the vehicle's shoulder belt and includes a slot to position it correctly over the child's shoulder. In our testing, we thought it really had a lot of bang for the buck. Coming in at such a low price, we were impressed by the weight range and overall comfort and styling. But there are some disadvantages. First, it doesn't function fantastically as a car eat or a booster, so while it's versatile it's not an expert at either functions. The primary limitations we found were: first, we think the seat is quite small for a growing kid, being both narrow and not very deep. Second, the lower seat padding leaves something to be desired. Third, it only has one recline setting so it doesn't fit very well in most vehicles. We did try it in a RAV4 with reclining rear seats and that helped, but it's disappointing that the booster itself has only one fixed recline position. Finally, it uses the LATCH system, but it's the old version of the system which is quite a pain to work with. Good overall bang for the buck with this booster seat, but some big limitations. The Evenflo Big Kid AMP Booster Car Seat: This is the most basic booster car seat option we have in our best booster seat rankings. It provides a lot of basic features, and comes in at the lowest cost of the bunch (less than $40!). Evenflo is known for providing low cost baby products with reliable quality, but without the fancy features, multiple pattern options, or high quality fabrics. This booster has a lot of things that the Britax and Graco offer: easily cleaned fabrics, two cup holders, some side impact and head/neck support, and height adjustment. It is lightweight at only 8 pounds, and the manufacturer states it can support children from 30 to 110 pounds. It is very low in price, and that shows in some of the features. First, the cup holders are small and awkward, holding contents with stretchy elastic straps. In a lot of cases, this requires 2 hands to get working, and things smaller than a cup tend to fall out. Second, the head and neck support aren't as substantial as the Britax and Graco options, making it more likely for you child to bob their head down during a nap. Third, it has thin foam padding that isn't as comfortable as the other options. Finally, the fabric softness and overall quality aren't on par with the other options. Overall, we put this on our list because it has some good basic features, comes from a reliable manufacturer of children products, and sells for less than $40. That's enough to get it on our list of the best booster car seats of 2019. But if that low price point isn't enough to get you excited, we suggest one of the pricier options!